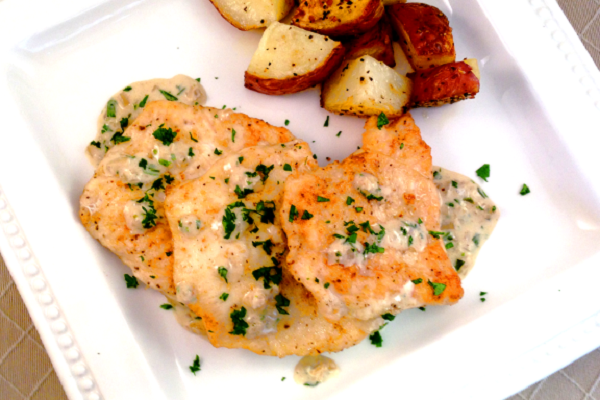 Sauteed chicken accompanied with a tarragon sauce and served with oven roasted potatoes. Tarragon is an aromatic French herb considered one of the finest in French cuisine. Our Tarragon sauce brings fresh tarragon together with shallots, brandy, broth and cream with each element playing off the other to create a distinct and memorable flavor. 1. Place each chicken into the flour mixture, cover thoroughly, then remove and set aside. 2. Heat 3 tablespoons of oil or butter in a large skillet over medium heat. When oil starts to sizzle, cook chicken 4 minutes per side until thoroughly cooked. 3. Remove chicken from skillet and drain excess oil from skillet. 4. Using the same skillet, add onion mixture and saute for 1 minute at medium heat. 5. Add sauce and heat for 1-2 mins more until sauce is warm but do not boil. 6. Pour sauce over chicken and serve. I prepared this for my dad, brother, husband and I and everyone raved about it. We even get the sauce prepared without onions due to my husband's intolerance of them. It was still delicious. I love adding the side of veggies. We had a nice mix of yellow & zucchini squash, brussell sprouts and cauliflower. That along with the roasted potatoes, which you could also enjoy with the sauce, was fantastic. Easy to fix and plenty for 4 with some left-over- we ordered the 4 servings. A delicious dinner you can't get tired eating. 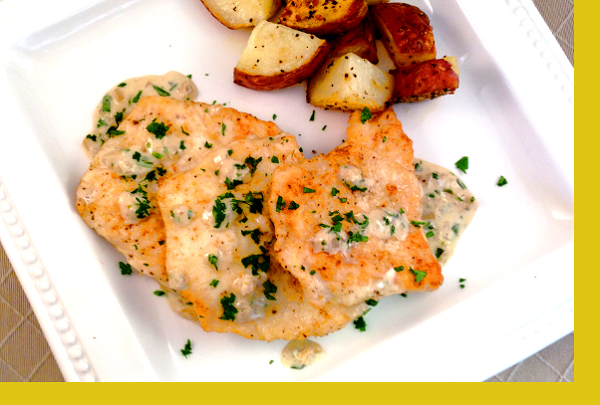 Tarragon sauce makes all the difference! The Tarragon Chicken was an excellent dish! We enjoyed it very much. And there were plenty of leftovers. The oven roasted potatoes were amazing! The instructions were easy to follow. Thank you Chef Maria! I don't think I've ever made a single dish featuring tarragon, but it's great. This is our favorite of all the chicken dishes. We look for it coming up in the menu. I am new to Maria's coming from another delivery service where the prep was supposed to be 20-30 mins but actually took more like 45-60 mins sometimes and I am an experienced cook. My husband and I are new empty nesters and I love Maria's! Easy to no prep and wonderful flavor on EVERY entree we have tried so far! Thank you Maria! This is one of my favorite chicken dishes from Maria (but they are really all so good). The sauce is so fresh, and flavorful - we love it! I love that her cooking times are always so spot on - makes it so easy! This is an especially quick dish, and one our favorites. Yum! Delicious meal! One can happily serve to family and friends. As always, Maria's fresh homemade sauce makes all the difference! Thank you Maria. Yet another yummy and easy to prepare dish. The sauce was amazing. This is definitely a keeper.